Date: Saturday, October 13, 2018 | 9:00 a.m. – 3:00 p.m.
With advances in modern medicine and significant societal shifts, how we age has evolved over the last couple of decades. Yet one constant remains: we all still age. 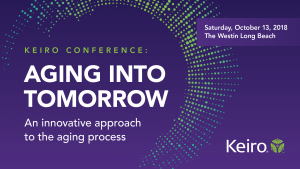 Keiro is proud to present its annual conference, “Aging into Tomorrow – An innovative approach to the aging process” on Saturday, October 13, 2018 at The Westin Long Beach. This one-day gathering for baby boomers, academics, caregivers, and older adults alike highlights an innovative approach to aging and the ways we can use forward-thinking to plan for our futures today. The conference will feature two keynote speakers. Dr. Carla Perissinotto, Associate Professor and Associate Chief of Clinical Programs in Geriatrics, University of California San Francisco, will speak about the latest research on social isolation and its effects on health, a topic for which she has gained national and international recognition. Peter Walsh, a television and radio personality, will share with us his expertise on decluttering and how to feel the joy that comes with living with fewer things. Attendees will also select two out of six different breakout sessions covering numerous topics: Mediterranean food, the only diet that has proven to have medical benefits; the latest research on Alzheimer’s disease and how to slow the process; the benefits and limitations of cosmetic surgery for the aging population; financial strategies to ensure your family is the biggest beneficiary; the benefits of learning about and utilizing the latest smart home technology; and the benefits of mind-body exercises like yoga, qigong, and tai chi. Registration check-in begins at 9:00 a.m., and the conference takes place from 9:45 a.m. to 3:00 p.m.
Keiro Conference registration will be $50 per person and is open until Monday, October 1. To register, visit www.keiro.org/conference. For any questions regarding the event, please call 213.873.5700 or email programs@keiro.org. Keiro is a mission-driven organization engaged in improving the quality of life for older adults and their caregivers in the Japanese American and Japanese community of Los Angeles, Orange, and Ventura counties. Keiro delivers a wide range of resources to address the challenges and barriers that aging presents: isolation, limited financial resources, complex health conditions, and cognitive and memory disabilities. Keiro also partners with companies and organizations that can expand its services and ability to reach seniors and caregivers, and participates in research and innovative work where Keiro can contribute to advancing progress in resolving the challenges of aging. Keiro is based in Los Angeles.